Kpreps.com would like to congratulate Everett Royer for submitting the winning photograph for Week 3 of the Playoffs in the Kpreps Friday Night Photo Contest. 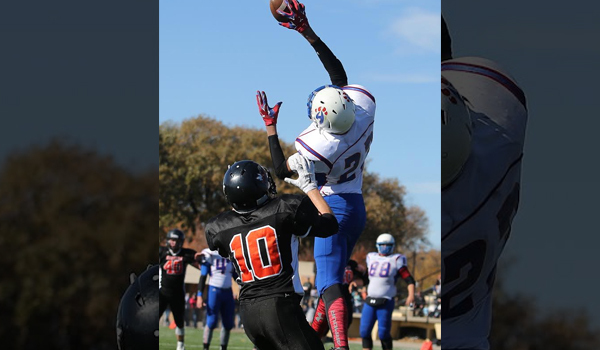 Everett’s photo captures Hanover defensive back Thomas Atkins making an incredible one-handed interception against Dighton in the 8-Man, Division II state championship game. The Wildcat defense intercepted six Dighton passes in winning the 8M-II title 68-22. For this winning photograph, Everett is eligible for our 2016 Grand Prize including $500 in cash. Each week during the regular season and playoffs, Kpreps will select a winning photograph that will become eligible to win the grand prize. This means there will be 13 photos chosen as finalists for the 2016 contest. Only weekly winning photographs will be eligible for the grand prize! Weekly winners will be featured on Kpreps.com.